Fireworks: Who’s burning the money? A moment from Itasca's 2008 fireworks display. We’ve updated this story with more information on Navy Pier finances. Thanks to our question-asker, Meg White, who pressed for more reporting. Colorful explosions will dart across the sky Thursday, emblematic of bombs bursting in air more than two centuries ago. And although many Fourth of July firework displays are free-of-charge to the public, someone is paying for this holiday pastime. Does the city of Chicago (i.e. : taxpayers) pay for the biweekly fireworks displays at Navy Pier? If you’re not familiar with the “biweekly” reference here, you should know that Navy Pier hosts a free fireworks show every Wednesday and Saturday between Memorial Day and Labor Day. Since 1995, the Pier has lit up the sky every Independence Day. Not to add more wrinkles to Meg’s answer, but you should know, too, that the city of Chicago once hosted its own Fourth of July fireworks show. City Hall stopped footing the bill in 2011, so now Navy Pier is the city’s only Fourth of July fireworks display. To answer Meg’s question, then: Navy Pier Inc., a nonprofit that manages the many activities and developments at Navy Pier, pays for the 10-minute biweekly light show. But that doesn’t really tell the whole story. Since it’s the season for fireworks, we searched to Fourth of July firework displays in the Chicago area. This year, the Illinois State Lottery is paying for the fireworks at Navy Pier, as well as several other firework displays around the state. The state lottery is sponsoring the Navy Pier fireworks at a cost of $20,000, which includes more than just colorful combustible shells. The state lottery is also helping sponsor displays in Champaign, Batavia, Rockford and Harvey. The latter couldn’t afford a fireworks display a year ago. In total the state lottery is paying $38,000 for fireworks as a marketing strategy to promote their Fourth of July raffle. Citing contract agreements, Navy Pier wouldn’t tell how much it costs to put on its 15-minute Fourth of July fireworks. However, other municipalities and nonprofits hosting firework displays this holiday seasons were happy to share. It’s worth noting that these displays are paid for by very different means. In north suburban village of Skokie, the village’s park district pays. It receives some funding from the Village of Skokie, said Michelle Tuft, superintendent of recreation and facilities. The district is not charged for using the property of local schools. Notably, Skokie markets its fireworks display as 3-D. If you’re asking yourself, “Aren’t fireworks already in 3-D?” Well, you’d be correct, but the first 10,000 people to arrive to Niles West High School receive a pair of 3-D glasses, with which you can watch the fireworks for "added effects." Crown Point, Ind., on the other hand, raises mostly private donations to pay for its fireworks display and Fourth of July Parade. Since the 1980s, a group of volunteer citizens have taken on the task of fundraising and organizing the town’s Fourth of July festivities. Other than a $5,000 grant from the city, the rest is put up by individuals and corporations. Donations range in all sizes. Some, we’re told, are as small as $3. In total Crown Point raises around $30,000. This year, one corporate sponsor — Mike Anderson Chevrolet in Merrillville — is paying for the entire fireworks display costing $17,000. Interestingly, Crown Point was the only place in the Chicago area contacted by Curious City that was not contractracting Melrose, a pyrotechnic company. Crown Point contracts with a firm called The Mad Bomber. 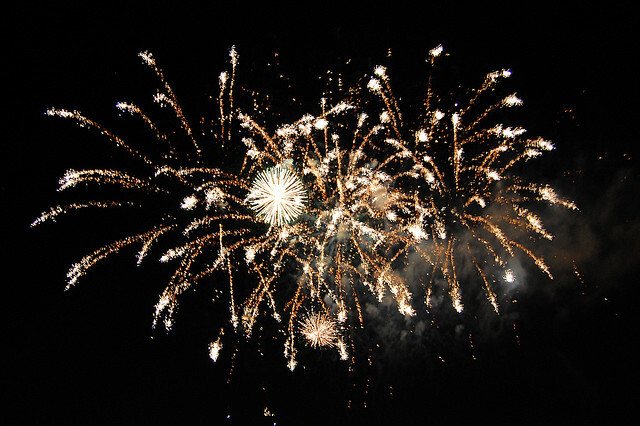 However, few firework displays compare to the size and scope of Itasca’s 3,500-shell fireworks extravaganza, which takes four days to build and spans 30 acres. The venue can hold up to 8,500 cars and attracts around 40,0000 people. Itasca’s show is a public-private partnership between the village and Hamilton Partners, a commercial real estate company. Roughly a third of the cost is covered using an Itasca hotel tax, which is earmarked for funding local special events. Around half the cost is offset by charging patrons $20 to park at the show (if that seems steep, organizers point out that the show itself is free). The remainder is paid for through corporate sponsorships. Organizer Richard Staback says Itasca’s display is one of the largest in the state. “There are more fireworks in our finale than most firework shows have in their entire show,” he said. UPDATE: Last week Meg White wrote she was unsatisfied with Curious City’s answer to her question regarding who pays for the semiweekly fireworks displays at Navy Pier. We reported that it’s Navy Pier, Inc., but the nonprofit, which incorporated in 2011, declined to give details as to the cost of its individual firework displays. In fact, the pier declined to give any cost figures at all. Regardless, there are figures that give a more complete picture. According to the company’s 2011 federal financial disclosure report (known as a “990”), Navy Pier Inc. paid $473,000 in 2011 to Melrose Pyrotechnics, an Indiana-based pyrotechnic company. It was Navy Pier’s third highest-paid independent contractor that year. There is no public data available for 2010 because Navy Pier, Inc., didn’t exist before 2011. The 2012 paperwork is not available on reporting sites such as guidestar.org. According to Shields, the nonprofit has not yet filed its paperwork for 2012. Some of the semiweekly summer fireworks displays at Navy Pier are sponsored by public or private sponsors. (Such was the case on the Fourth of July when the Illinois Lottery purchased the sponsorship for $20,000.) The money generated through these sponsorships helps offset the cost that Navy Pier pays for fireworks services throughout the year. However, sponsorships don’t cover the full amount. Shields didn’t know how much of the cost is not covered by sponsorships, he said, as not all of the money Navy Pier receives from its firework-display sponsors goes directly toward shells and mortars. But he did say sponsorships don’t cover all of the costs. As for taxpayers footing any remaining bill? It’s worth noting that Navy Pier, Inc., received about 2.7 million in government grants in 2011, which was about 10 percent of their total revenue that year. The rest is generated from parking fees, amusements, retail and special events. To view Navy Pier’s public 990 report, please find the attached document at the bottom of this story. Chelsi Moy is a Curious City multimedia intern at WBEZ. Follow her @chelsimoy.